Weddings are one of our special delights. Making a bride happy is always a joy. 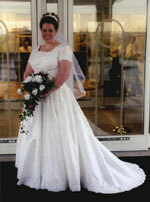 We do Renaissance and period weddings such as Victorian or 1920's regularly. But modern and traditional gowns also get our loving attention. Non-traditional brides, Mother-of-the-bride and bridesmaids are also a part of our repertoire. After all a wedding is a production with the bride and groom as the stars! All apparel is custom made and may need a minimum six month lead time. Muslin fittings are done first to help with final decisions about fit and style before expensive materials are cut. We provide a free initial consultation and a price estimate. At the time of booking, a 50% deposit is required. If you don't live near Michigan and want to find someone to make your wedding dreams come true, check at your local quality fabric store for referrals or contact a local chapter of the Professional Association of Custom Clothiers, or try your yellow pages under costume design or fashion design. Make sure to ask for references or a portfolio of previous work.